Subversion is the most popular open-source version control system on the planet. Development teams-big and small, enterprise and open source-use this fast, feature-rich tool daily. Pragmatic Guide to Subversion presents the 48 essential tasks you need to know. It’s your shortcut to the Subversion master’s recommended set of best practices. With this book, you can get to the good parts quickly, and be more productive and effective. Pragmatic Guide to Subversion has everything I needed to get up and running with SVN on my Mac. Being new to Mac OS X, it was a welcome surprise to have examples in multiple operating systems. This is a book worth having since the “full” Pragmatic Subversion book is too big for every developer on a team to read. I was a fan of Mike’s original Subversion book, and he’s carried on the style into this pocket reference. This is a book I recommend. A good digest of Subversion’s capabilities. The author’s writing style is terse yet conversational, and the book progressed nicely from basic topics to those more advanced. Overall, I think the book is an excellent follow-up to Pragmatic Version Control Using Subversion. I really like the organization of the book. I found Pragmatic Guide to Subversion to be very easy to read, and it really gets the information across in an engaging way. This book is clear, concise, and comprehensive. It’s an indispensable reference for anyone working with Subversion. Mike has been around the block with Subversion and knows the toolset intimately. Just as importantly, he’s seen firsthand how it’s used on real projects. Those two aspects come together in this book with the fundamentals of source control with Subversion, guided by real-world, pragmatic (of course!) experience. As a Subversion user and occasional noob, this is the book I want to guide me day to day and dig me out of those irksome holes. In Pragmatic Guide to Subversion, author Mike Mason shares the features and practices that have made Subversion so successful. 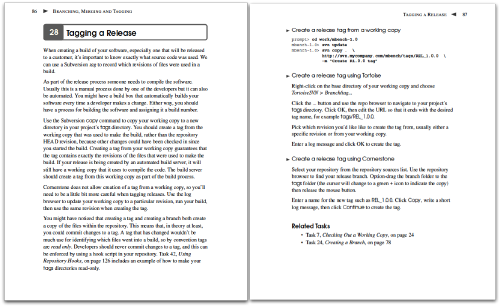 Each of the 48 tasks selected for the book is presented as a quick two-pager, with a succinct description on the left side and a quick reference on the right. The book is designed for experienced developers—you want to get straight to the tricks and traps you’d otherwise learn by trial and error. Subversion started life as a command-line tool, but graphical clients are now extremely popular and can offer a lot of extra power. For every task in Pragmatic Guide to Subversion, you get to see how to carry out the task via the regular command-line client as well as the TortoiseSVN graphical client for Windows, and the Cornerstone graphical client for Mac. Whether or not you’ve used other version control tools, you’ll learn Subversion’s popular way of working—how to access your source code, make changes, and share them with your team. Mike Mason is an Agile Architect with ThoughtWorks where he builds mission critical systems for Fortune 500 clients. Mike has been using Subversion for more than eight years and he has watched it evolve from an excellent-but-niche tool to being an enterprise standard in version control. Mike is the author of Pragmatic Version Control using Subversion.